The Dynamic Radar Cruise Control system is the next evolution of standard speed control systems. While you can set a preferred speed to travel, this feature will automatically adjust based on traffic conditions. Cameras and sensors can determine how far away you are from the driver ahead of you. 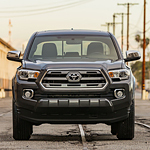 If traffic slows down, the Tacoma will follow without disengaging cruise control. The Lane-Departure Warning system uses cameras and sensors as well. However, they're tuned to read the markings on the road. This system activates automatically when you're driving over 32 MPH. If you start to drift out of your lane, various alerts will sound to let you know.